But she gets assigned to paper because no one chooses paper because it is stupid. Why would you choose paper when you could work with metal (she wants to work with metal). But there she is, so she goes to the home of her new instructor guy whose apprentice she'll be. And the guy (Magician or "Mg." Thane) turns out to be like 30 and okay looking, at which point I went "ugh" because I kept trying to convince myself I was NOT reading YA, but it turned out to be overall okay. 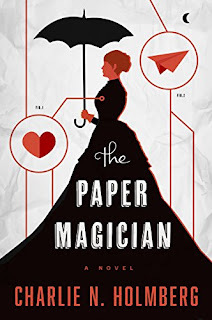 Mg. Thane shows her how paper is actually THE NEATEST and also he disappears on these mysterious errands and then one day an evil magician who has bonded to the material of human flesh comes and takes out his heart. Oh no! The VAST majority of the book is Ceony getting his heart back. But it's all like a metaphor and yet not for her getting to know him really well? Whatever. It was good. I read it in like a day, which almost never happens, but it just speeds right along. There are are least three others in this series and I'm currently interested in them all. My hope is the whole magic world gets fleshed out a little more, as this book was pretty restricted to Ceony, paper, and Mg. Thane's house. The moral here is: give your book an excellent cover and I will at least try to read it. I’m a little embarrassed that not only do I not recognize this book, I don’t know the series AT ALL. But I couldn’t agree more with the moral here, except I’d adapt it to “give you book an excellent cover and I will at least pick it up." Just got this from the library! I have that same feeling, as soon as the protagonist describes a new character as handsome or even remotely ok-looking. Welp, here's the obvious love interest and it's gonna go down either two ways: a) happily ever after or b) an angsty love triangle as soon as the second ok-looking person shows up.